Everyone has their favorite go to breakfast that they love. Mine is the Toad in a Hole. This is one that I remember eating growing up. My mom would make it often because of how easy it was and how little of ingredients you need. Perfect for a mother of eight children. I've added a few things to it over the years to make it more my own, but it's still the same meal from my child hood. Heat a pan on the stove over medium heat. Grease the pan with either cooking spray or butter. Cut a hole in the middle of a piece of bread. I use a shot glass or small cup. 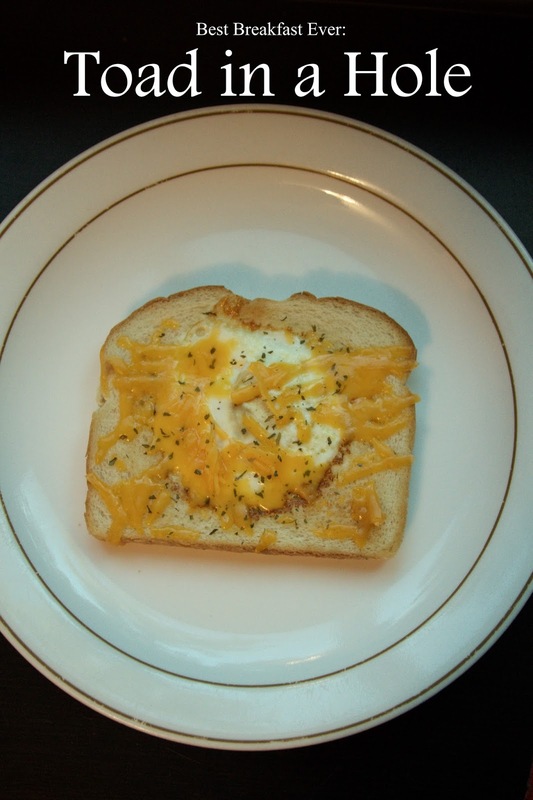 Place the bread in the pan and break an egg into the center. Let cook for 1-2 minutes. You want it nice and firm on the bottom so it wont break when you flip it. When its firm on the bottom, flip the bread with a spatula being careful not to break the yolk. Sprinkle cheese and parsley on top. Cook for about another minute. The longer you cook it the harder the yolk will be, so if you like it runny for bread dipping, only cook it long enough to solidify the whites. We eat this for dinner a lot too. My husband likes to put Tabasco sauce on it to give it a little spice. Of course the cheese and parsley are optional. You could also pare it with sausage if you want a more heart meal. Enjoy!